HOUSTON - A Flood Warning was issued for Harris County on Friday night and was to remain in effect until further notice. A Flood Warning was also issued for Montgomery, Galveston, Brazoria, Burleson, Washington, Polk, San Jacinto, Polk, Matagorda, Wharton and Walker counties. County officials said South Mayde Creek at Greenhouse Road was going out of its banks around 9:30 p.m. and would likely cause flooding in Cullen Park. Officials also said a Flood Warning was issued for Halls Bayou at Airline Drive until further notice. Officials also said they planned to close the intersection of SH 288 and Calumut Street because of high water on the feeder road. Barriers have been set up at the 6800 block of Jensen. City officials said between 4 p.m. and 8 p.m., there were 250 reports of vehicle accidents. Between 8 p.m. and 10 p.m., that number dropped to 41. All of the accidents were minor, officials said. Heavy rain became more widespread Friday afternoon and continued through most of the evening. The worst weather came Friday night and is expected to last through Saturday morning. It is important to be weather aware through Saturday. 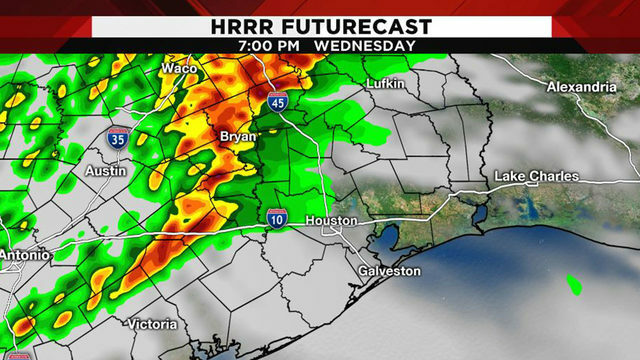 Pinpointing the hardest hit areas will be difficult, but according to KPRC2 meteorologist Justin Stapleton, computer models are suggesting Harris County down into Galveston and Brazoria Counties as the hot spots receiving the highest rainfall totals. Overall, we are expecting anywhere from 3-6 inches of rain with some areas seeing isolated pockets of more than 6 inches. It is important to be prepared for all options from 2 inches of rain, which would only cause street flooding concerns, to more than 5-6 inches of rain, which could cause creeks and bayous to push their banks. Driving conditions could be dangerous, so be mindful if you are planning on going to any holiday parties or other plans you might have. Never drive into high water, and stay off roads when heavy rain sets in, if possible. Street flooding is a potential concern, and it will be important to monitor current weather and road conditions when heavy rain sets in. Quick rises could also occur on local creeks and bayous. Severe weather is a more isolated threat but possible with this system. Isolated tornadoes are possible Friday night into Saturday morning. 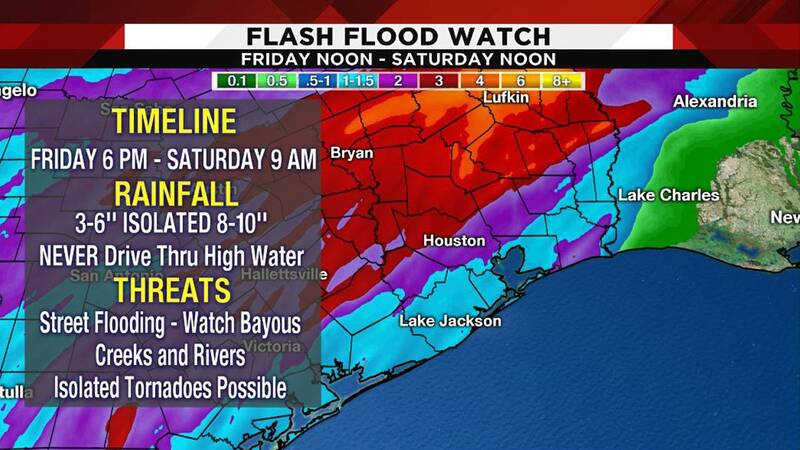 The fast-moving system is expected to clear by 5 to 6 a.m. Saturday. The remainder of the weekend will be sunny and chilly with afternoon temperatures returning to the 50s.